My husband and I discovered a great love for boxers in 2006 when we got our first boxer, Maya. Diesel followed one year later and then Chica in 2010. We are forever thankful to the breeders that entrusted us with the love and care of these beautiful dogs. Everyday our boxers teach us that life should be fun and we should be thankful to wake up and kiss our loved ones each morning. Our dogs are a part of our family and they sleep on our bed and not in a separate kennel area. For fun we train together for conformation, agility, and obedience competition. It is a great way to spend time with and build a better relationship with our dogs. We are excited that our first breeding is scheduled for late 2012. 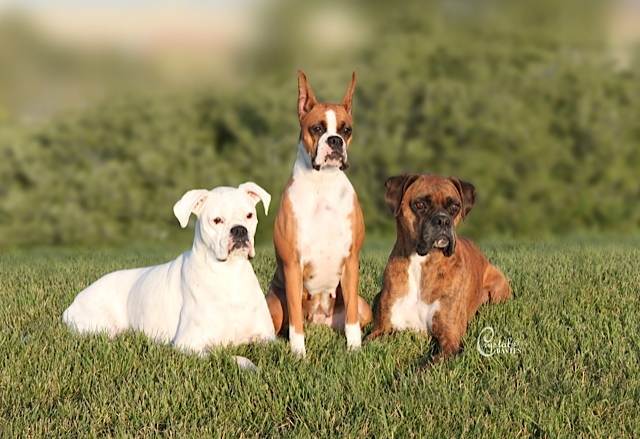 Our kennel is focused on breeding healthy and happy boxers that represent the best structural and temperament qualities required to excel in performance sports. Our goal is to breed only when we ourselves are ready for our next “boxer kid”. All of our boxers are health tested for DM, heart, thyroid, and ARVC. I hope you enjoy browsing our website and learning more about our boxers.